Mexico Hit With 7.1-Magnitude Earthquake; Dozens Of People Killed : The Two-Way Thirty-two years after a deadly earthquake, a magnitude 7.1 temblor rattled Mexico City and surrounding areas. Residents had marked the anniversary of the 1985 quake earlier in the day with drills. With the help of searchlights, rescuers, firefighters, policemen, soldiers and volunteers continue removing the rubble and debris from a flattened building late Monday in search of survivors after a powerful quake in Mexico City. More than 200 people were killed and dozens of buildings were collapsed by the earthquake. The head of Mexico's civil defense agency has lowered the number of people confirmed dead in Tuesday's earthquake. Luis Felipe Puente now says 217 people were killed. Earlier he said the death toll was 248. He gave no explanation for the revised number. The death toll continues to rise in Mexico after Tuesday's earthquake. The country's national civil defense agency confirmed the death toll stands at 248. Rescue teams are digging through the rubble to find survivors. Mexico's civil defense agency has raised the death toll from Tuesday's earthquake. Officials say 226 people have died — more than half in the capital Mexico City. Thirty-two years to the day after an earthquake killed thousands of people in Mexico, a powerful quake rattled the country's central region Tuesday. Buildings shivered in Mexico City, and dozens collapsed, sending clouds of dust skyward. Residents, who just hours before had taken part in large simulated-earthquake drills to mark the anniversary, emptied into the streets when the real quake struck. "Many people had just returned to their desks when the real one hit," freelance reporter Natasha Pizzey told All Things Considered. "It was one of the worst feelings I've ever experienced in my life," she said. "It's a bit like being on top of a double-decker bus that's trying to brake and you're thinking you're about to get thrown. And of course, you're thinking, 'Are things going to fall on top of me — is the building going to collapse?' 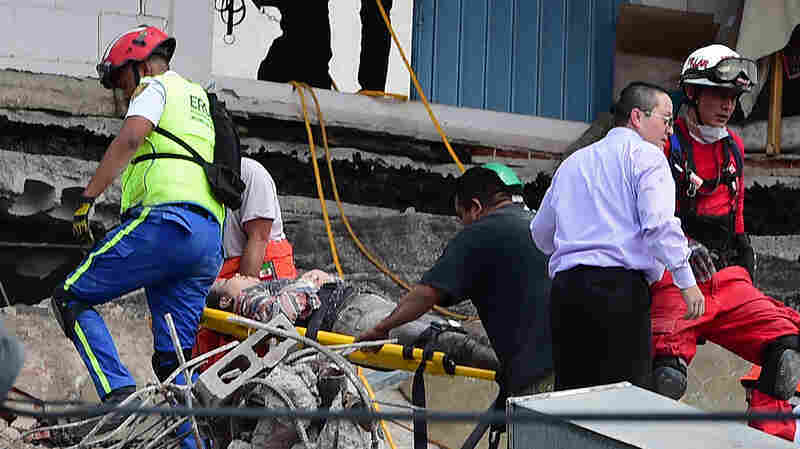 "
A woman is carried on a stretcher after being pulled from the debris of a collapsed building in Mexico City on Tuesday. In its preliminary assessment, the U.S. Geological Survey said the magnitude 7.1 earthquake's epicenter was just over 3 miles east-northeast of Raboso, in the state of Puebla, some 75 miles southeast of Mexico City. In the neighboring state of Morelos, 54 people were killed, according to local officials and news reports. Alfredo Del Mazo, governor of the state of Mexico, tweeted that at least nine people have died in his state. And Puebla Gov. Tony Gali told an emergency meeting of local officials that at least 26 people had died there, several of whom were children. Nationwide, at least 149 are reported dead, and it is expected that the death toll will continue to rise. Mexico City Mayor Miguel Angel Mancera said that 44 buildings had collapsed. "I could barely stand up. There was glass falling everywhere. I really thought the building was going to fall," reporter Emily Green told NPR from Mexico City. "It was a terrifying experience." Photographs depicted rescue workers digging through rubble and wheeling away residents on stretchers, though it was not immediately clear how many people were injured or killed in the capital city. As NPR's Jon Hamilton notes, the densely populated city is "especially vulnerable to earthquakes, because much of it is built on a former lake bed, which can amplify the effects of distant quakes." 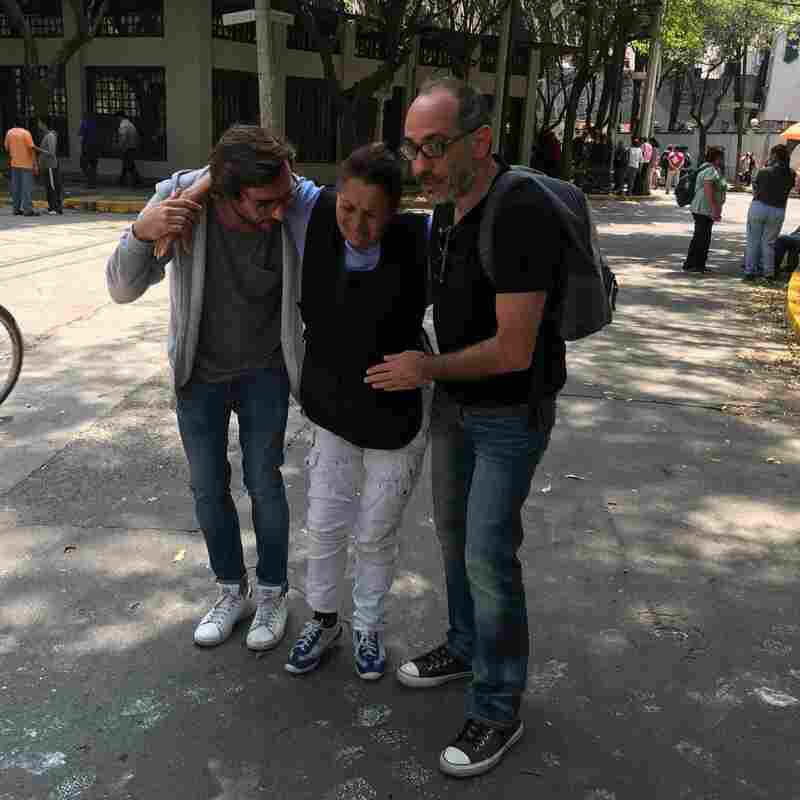 Men help a woman injured in Mexico City during the earthquake on Tuesday. A government website shows a map of damaged buildings in the capital. Videos purported to show buildings shaking under the strain, including a whole office building in the neighborhood of Roma Norte. "We don't have an estimate yet from authorities of how many buildings — but just photos and videos from people in the street show there are many buildings collapsed so far," reporter James Fredrick told NPR. 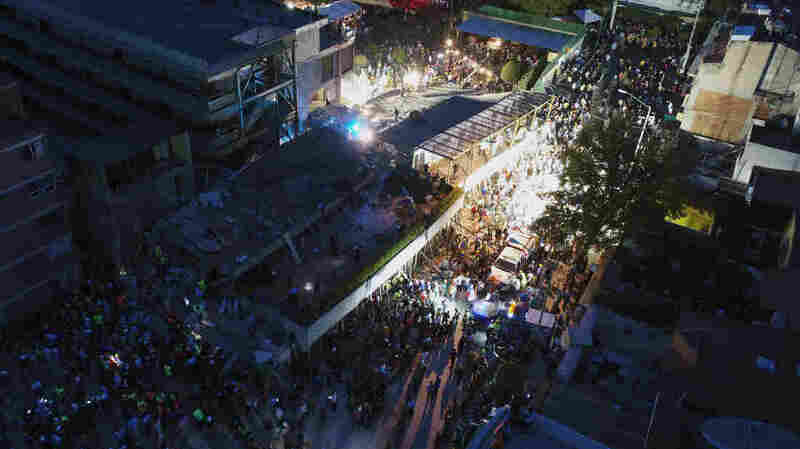 "The civil protection agency of Mexico City has confirmed that they're beginning excavation work for people trapped inside collapsed buildings." Another problem loosed by the quake: Gas leaks have been reported across the city, some of which have already resulted in fires, according to Fredrick. "God bless the people of Mexico City," President Trump tweeted Tuesday in the aftermath. "We are with you and will be there for you." Late Tuesday, State Department spokesperson Heather Nauert said "Our thoughts and prayers are with the people of Mexico affected by today's 7.1 magnitude earthquake and other recent natural disasters. We stand ready to provide assistance should our neighbors request our help." 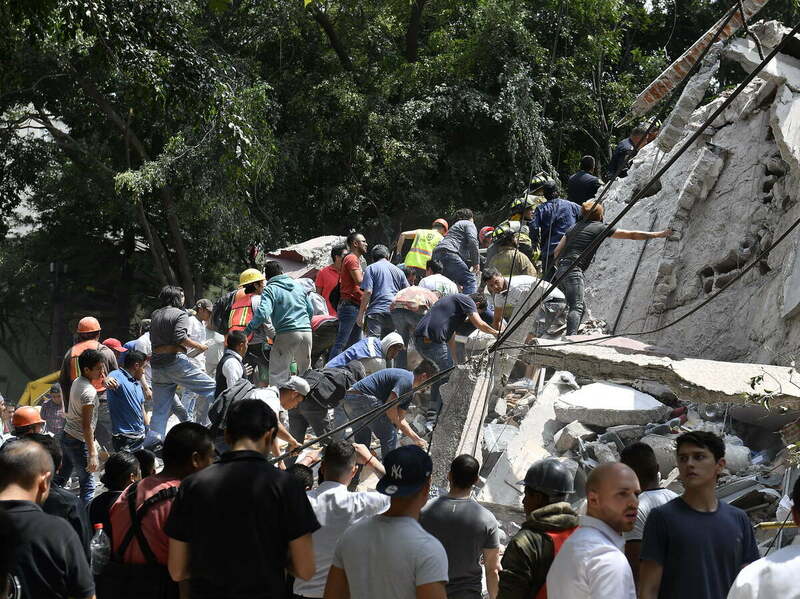 People remove the debris of a collapsed building as they look for possible victims after the 7.1 magnitude quake rattled Mexico City on Tuesday. The earthquake also comes less than two weeks after a massive temblor struck southern Mexico, killing dozens of people. The 1985 earthquake that officials were marking Tuesday left thousands dead and parts of Mexico City in ruins. Univision's Enrique Acevedo noted that a national earthquake drill was scheduled for 1 p.m. local time. "It's a law that all schools and public institutions have to do a safety drill on Sept. 19," Greg Berger, a journalist and professor in Cuernavaca, in the state of Morelos, told NPR's Adhiti Bandlamudi. His 10-year-old son had already taken part in a drill at school in the morning — "then it started shaking again, and my son told me that he thought it was another drill, but a high-tech drill. He thought it was kind of cool, because he thought they were making the floors move." The quake was not so gentle with the rest of Cuernavaca. "This is an indigenous town, and a lot of the older walls made out of adobe are collapsed," Berger said. "There's debris in the street. There are a lot of people who are still afraid to go back to their houses." But, he added, the survivors have been supporting each other in the aftermath. "I think there's a long history in Mexico of the best in people getting brought out by these kinds of disasters, and I can see that in my neighborhood right now," he said. "People are watching out for each other, and there's going to be a lot more of that to come over the next few days."